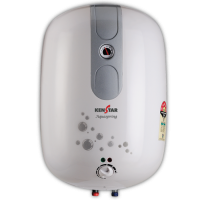 This kenstar aquaspring water heater has a capacity of 10 litre which higher storage capacity for family use. It has 5 star rating with the best power saving. It's thermal cut out long life of heating element and overheating protection. This water heater comes with external temperature control. To Recieve updates and possible rewards for Kenstar Aquaspring 10 L please sign in. To Recieve updates and possible rewards for Geyser/Water Heater please sign in.